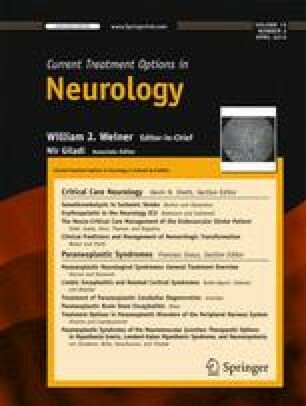 Paraneoplastic brain stem encephalitis can occur as an isolated clinical syndrome or, more often, may be part of a more widespread encephalitis. Different antineuronal autoantibodies, such as anti-Hu, anti-Ri, and anti-Ma2 can be associated with the syndrome, and the most frequent tumors are lung and testicular cancer. Anti-Hu-associated brain stem encephalitis does not normally respond to immunotherapy; the syndrome may stabilize under tumor treatment. Brain stem encephalitis with anti-Ma2 often improves after immunotherapy and/or tumor therapy, whereas only a minority of anti-Ri positive patients respond to immunosuppressants or tumor treatment. The Opsoclonus-myoclonus syndrome (OMS) in children, almost exclusively associated with neuroblastoma, shows a good response to steroids, ACTH, and rituximab, some patients do respond to intravenous immunoglobulins or cyclophosphamide. In adults, OMS is mainly associated with small cell lung cancer or gynecological tumors and only a small part of the patients show improvement after immunotherapy. Earlier diagnosis and treatment seem to be one major problem to improve the prognosis of both, paraneoplastic brain stem encephalitis, and OMS. Dr. Blaes is supported by the Deutsche Forschungsgemeinschaft (Bl 452/2-3) and the German OMS parents group. Dr. Blaes has received honoraria for giving lectures from Grifols. Titulaer MJ, McCracken L, Gabilondo I, et al. Treatment and prognostic factors for long-term outcome in patients with anti-NMDA receptor encephalitis: an observational cohort study. Lancet Neurol. 2013. doi: 10.1016/S1474-4422(12)70310-1.